At the end of each painting session you need to step back and review what you have done. You need to check to make sure everything makes sense. After my last session on the painting I realised there were some improvements that needed to be made. Painting is very much about meeting challenges and finding solutions. We are all tempted to just keep on going but in the long run problems will catch up with you and the final painting will be very disappointing. So I am making some changes to our painting. Some of these changes are to make it a better painting but some are to make it easier for you to follow along. Getting the houses right is essential to painting the town. 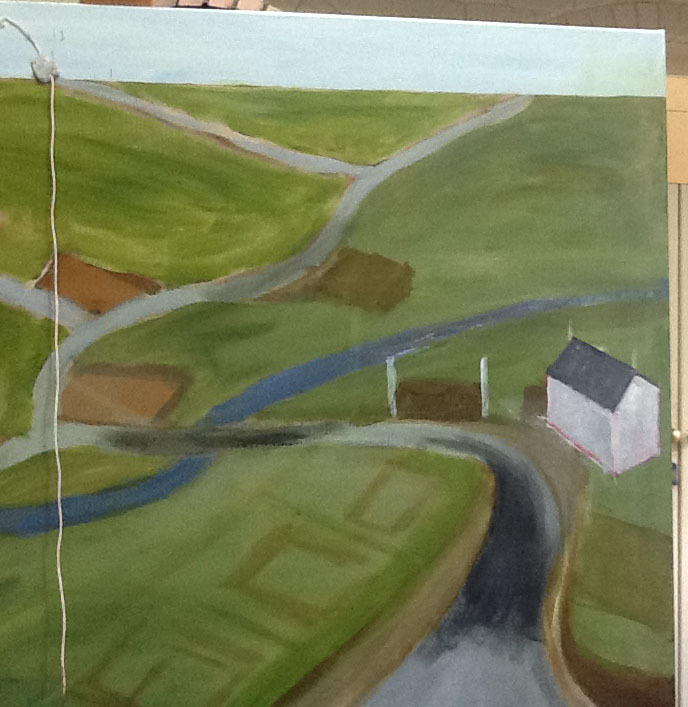 I've painted the river/stream a deeper blue so that it doesnt get confused with the roads which are light grey. I've extended the main road on the right hand side (bottom) to go around the corner. This will make for a far more interesting painting which you will see later. I have slightly widened the road on the far left hand side (bottom). I have roughly shaded in places in the roads to indicate “dips” where the road runs downhill. 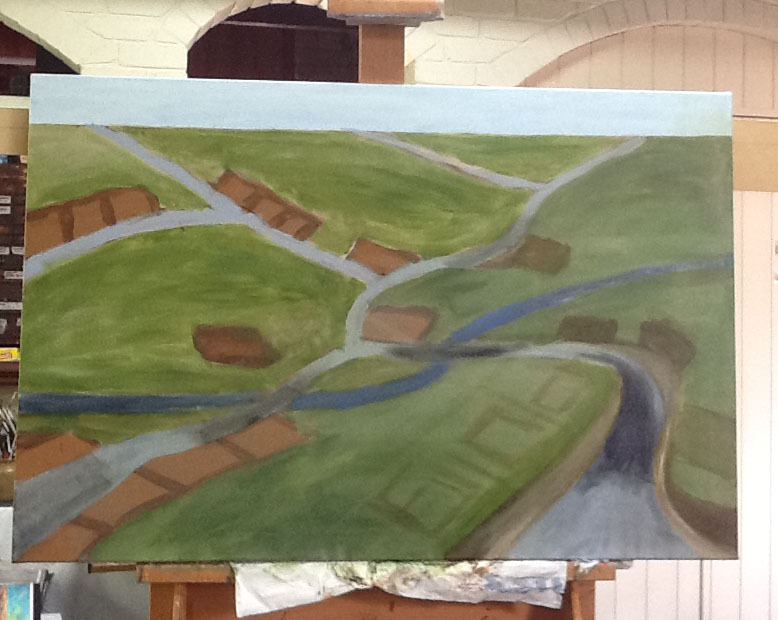 I have painted the background ground colour green so that it doesn't get confused with the brown umber I am using to outline the houses. The green also helps enhance the image of a rural town in your MindStudio. I’m still in Prep as far as making teaching videos go. I keep forgetting to stand to one side so you can see what I’m doing. Also, my apologies for the poor quality of the video which was made with my iPad as my camera is away being repaired. I’m borrowing a camera so the next video will be better. There won't be a Blog for a couple of days as you take time to watch the video and have a go at drawing and painting a cottage.